Paula Radcliffe is the undisputed number one marathon runner in the world, and so it should not be all that surprising to us when she shows up and pulls out a performance like she did in New York today. However, her “legacy” has been unfairly punctuated by one failure every four years – the Olympic Games, where she failed to finish (in 2004) and came 23rd (in Beijing). However, on any other stage, she has been so superior, so dominant that we should all be thankful that we have enjoyed her for the last 8 years. Today, taking on what is arguably the strongest field ever assembled for a women’s marathon, she hit the front after about 10 meters, and stayed there. She didn’t exactly set the field alight with the early pace, which was actually slow, in large part due to the strong winds, but in the post-race interview she revealed that her strategy was to keep the pace in the first half comfortable and run a negative split. But the sight of Radcliffe in the lead right from the gun is always a sign that she is supremely confident, and when she is confident, it means she is in great condition. And that means everyone else is pretty much running for second place. And so it proved. She never faltered, leading from start to finish and crossing the line in a relatively slow 2:23:56 to claim her third New York title. The analysis is below. 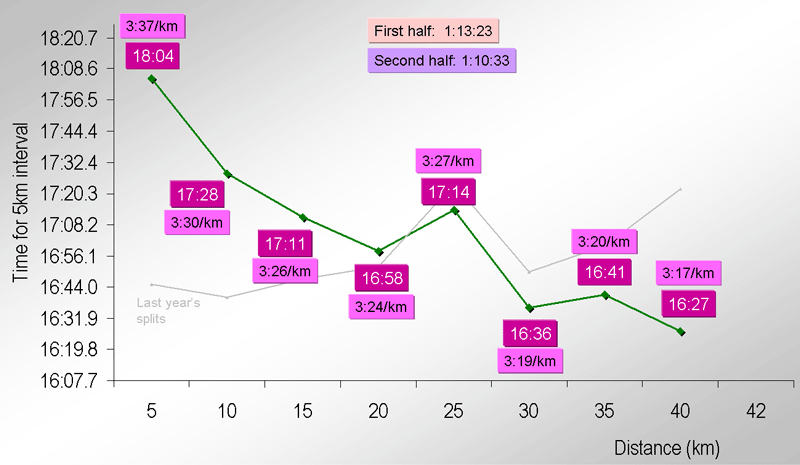 The table and graph below shows the pacing strategy during the race. 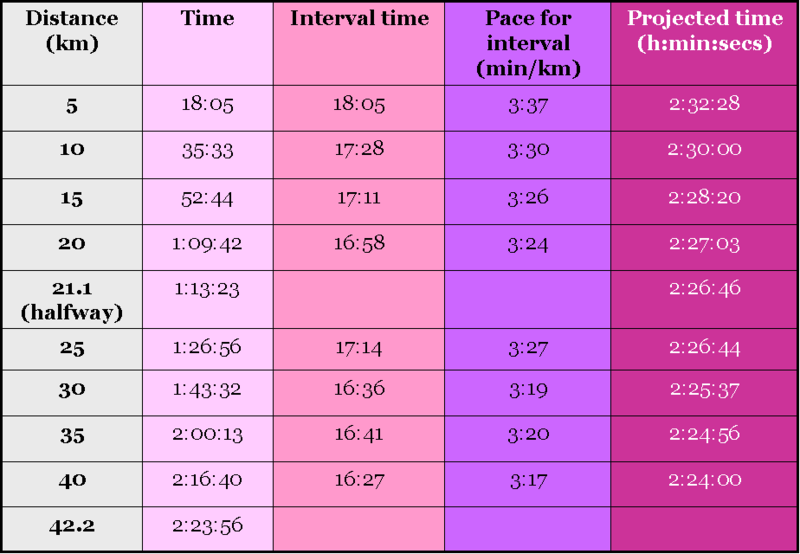 It is very much a Paula-pacing chart, since she did all the work setting the pace. For comparative purposes, I’ve also shown the splits from last year’s race (the faded grey line), because it shows you how differently this year’s race unfolded. What is most noticeable is that the early pace was incredibly slow – 18:05 through 5km is very slow, largely as a result of the strong wind. How slow? Well, last year, the first 5km was covered in 16:45, and 10km in 33:25. This year, they hit 5km in 18:05 and 10km in 35:33, over 2 minutes slower for the first quarter of the race (that wind would force the men into an incredibly slow early pace as well, as we show in our men’s analysis post). The pace got progressively quicker and quicker, and they hit the halfway mark in 1:13:23. At that point, there were six women in the lead group, and surprisingly, Catherine Ndereba was NOT one of them, having dropped off by about 100m a few kilometers earlier. Gete Wami was there, looking to finish in the top 2 to claim the World Majors title. So was Kara Goucher, the marathon debutant from the USA, who was shadowing Radcliffe. Her debut half-marathon last year (66:57) was a big part of her confidence, particularly given that she beat Radcliffe with that performance. Whenever anyone with a super-fast half marathon steps up to the marathon, look out! (think Wanjiru, and Evans Cheruiyot last month in Chicago). Just after 30km, the relentless pace began to tell. The 5km interval between 25km and 30km were covered in 16:36, a pace of 3:19/km and it did a great deal of damage. First, Goucher went off the back. Then it was Wami, who watched as $500,000 disappeared into the distance. Then, at about 32km, Dire Tune of Ethiopia fell off, leaving only Ludmilla Petrova of Russia to keep Radcliffe company. Meanwhile, Goucher held strong and having been dropped, was fighting to stay in touch. She’d moved ahead of Wami and Tune into third. Then at 34km, the final Russian resistance was broken. Radcliffe opened up 10 m in no time at all, and Petrova’s challenge was over. It was an incredibly brave effort from a 40-year old, whose race then became a challenge to see if she could crack the veterans world record. But Radcliffe was clear – there was to be no repeat of last year’s race through the Park against Wami. This year, the race was over with 20 minutes to run. Still, she got faster and faster, as the graph above shows, and won in glorious isolation to stamp her name on 2008, at the final time of asking. Behind her, Goucher had fought a great race to claw her way back into third place, a great debut performance and she’ll be a name to look out for in the future. She was in sight of Petrova for second, but in the end, the 40-year old Russian in a new world record of 2:25:42. Gete Wami, meanwhile, had a day to forget, finishing in 2:29:25 and losing out on the world Majors title, which goes instead to London and Berlin Champion, Irina Mikitenko. But the undisputed number 1, when healthy, is Paula Radcliffe, and she confirmed that today. Check out the men’s analysis above!